We hope everyone is having happy holidays. Last time, we defended Lehman Brothers from Andrew Ross Sorkin’s attack in Too Big to Fail. We’ve stolen some time from the seasonal festivities to take another look at the numbers, and we still feel there’s a strong case to be made for the way Lehman Brothers managed its finances right before its fall. 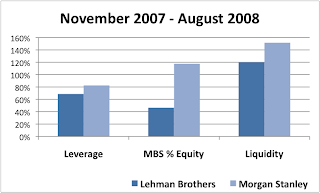 We compared Lehman to Morgan Stanley from November 2007 through August 2008, the three reporting periods leading up to Lehman’s collapse in September 2008. We looked at the progress each firm made improving three key measures of financial strength: leverage, exposure to mortgage-backed securities, and liquidity reserves. 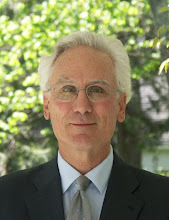 We calculated leverage as the ratio of total assets to shareholders’ equity, exposure to mortgage-backed securities as the book value of residential and commercial mortgage-backed securities as a percent of shareholders’ equity, and liquidity reserves as total cash and unpledged liquid securities. To gauge the improvement in each measure, we calculated its value in August as a percent of its value in November. In Sorkin’s account, Lehman Brothers went bankrupt because it had too little capital to absorb the potential losses from its real estate investments. But Lehman did much more to reduce leverage and cut exposure to mortgage-backed securities than Morgan Stanley, yet Morgan Stanley survived. It’s true that Morgan Stanley did a better job of boosting liquidity than Lehman, but it needed to. Morgan Stanley did much more prime brokerage business with hedge funds than Lehman. It was the run-off in prime brokerage funds that brought Bear Stearns down, and it nearly ruined Morgan Stanley too. In the week after Lehman failed, Morgan Stanley went through nearly all $180 billion of its liquidity reserves and had to go to the Federal Reserve for rescue. So what’s the risk management lesson in all this? Did Lehman Brothers deserve to die? Did it commit suicide, or was it killed? Could it have done anything to save itself? Too Big to Fail makes Lehman’s fate seem inevitable, and we agree. Like any investment bank, Lehman relied on confidence-sensitive financing, and in September of 2008 the financial markets lost confidence in Lehman – and Morgan Stanley and Goldman Sachs. Nothing they could do about leverage, exposure to mortgage-backed securities, or liquidity reserves mattered. Except convince anyone it was doing anything right at all. In his new book Too Big to Fail, Andrew Ross Sorkin portrays the firm’s fall as a tale of arrogance, blindness, stupidity, complacency, and greed – nearly every vice but gluttony and lust. But the numbers don’t bear that out: Lehman reacted decisively to the problems it was facing. For financial institutions in trouble the prescription has always been: reduce assets, increase equity, improve liquidity. What did Lehman do? It cut total assets and raised shareholders’ equity, driving leverage down by 31%. It boosted its liquidity reserves to $42 billion, and trimmed short-term repurchase funding. By the end of August 2008, Lehman had written down its troublesome real estate assets by 25% from the beginning of the year to $46 billion. With $28 billion in equity, it could afford to write them down by another 39% without destroying its capital base. So why did Lehman’s damage control efforts fail? What sank the company? We’ll explore that in future posts, but it’s clearly not because Lehman ignored its problems, failed to act, or didn’t make real improvements to its finances.